Single Mom Cuts Her Grocery Bill By 90% Each Month. To help kick off the weekend, I have some more easy weekend recipes, but first, I want to share with you a sweet secret recipe for chocolate peanut butter cups. 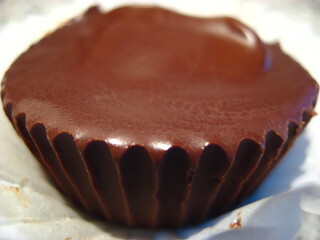 These peanut butter cups taste just like the ones you buy at the store and you will not believe how easy they are to prepare. This recipe is only one of the yummy candy recipes featured in the “Delicious Candy Recipes” cookbook. This book contains a vast collection of recipes for making all of your favorite candies. Coat a small cup muffin tin with cooking spray. In a microwave-safe bowl, microwave chocolate with butter and oil, stirring often,until melted, 1 to 2 minutes. Pour about a tablespoon of the chocolate mixture into each muffin cup. Melt peanut butter in microwave, 30 to 40 seconds. Spoon about 1 teaspoon of melted peanut butter over chocolate in each muffin cup. Top with another tablespoon of chocolate. Chill in refrigerator 30 minutes, until set. Makes 12 peanut butter cups. Find these recipes and many more our Recipe Exchange Forum. 3) 3 Weird Belly-Flattening Secrets Revealed! Transform your body with Miami’s hottest diet secret.